Most of the instant play casino games at WinADay Casino are tied to one progressive jackpot so it’s hit quite frequently. 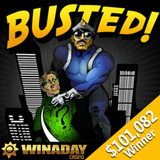 They've just had another winner, this time for $101,082! Mary J. won $101,082 playing the Busted slot game earlier this month. The winner said she'd like to use some of the cash she won to take a road trip across America. She said this has been a dream of hers for a long time and, once she’s paid some bills, that dream will come true. Frequently hit online casino progressive jackpot is usually won before it hits $200,000. Although the winner said she’d be practical with some of the money she also hopes to make a personal dream come true. Have you played Busted? It's is a retro comic book-style cops and robbers adventure with an excellent Bonus Game. You choose to be either a Robber or a Cop and then collect symbols that trigger a bonus game. Mary actually doesn't play Busted as much as she plays some of WinADay's other slots. In January, a young mother won a $205,200 progressive jackpot playing the Chinatown slot game. She also said she’d take a trip with her winnings but her dream is to go to the Olympics in Rio.